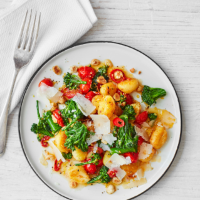 It’s worth browning off the cooked gnocchi, as the crisp texture turns this dish into something special. 1. Heat 2 tbsp oil in a large frying pan and gently sauté the garlic and chilli until golden – about 2 minutes. Add the tomatoes, then remove from the heat and set aside. 2. Bring a large pan of salted water to the boil. Add the broccoli and simmer for 1 minute, then scoop out, rinse in cold water, drain and roughly chop. Add the broccoli to the tomatoes. 3. Place the gnocchi in the boiling water; when they float to the top, after 2-3 minutes, scoop them out, then dry on kitchen paper. Reserve a cupful of the cooking water. 4. Heat a second frying pan with 1 tbsp oil. Add the gnocchi and fry for 5 minutes, until golden on both sides. Reheat the sauce, add the gnocchi and gently mix together with the remaining 1 tbsp oil and a splash of the reserved cooking water. Sprinkle with the hazelnuts, lemon zest and cheese to serve. This recipe was first published in Sun Jan 01 15:00:00 GMT 2017.